It must be remembered that up until possibly the end of the 19th century many composers were first and foremost improvisers. They were admired world-wide as performers and only after that perhaps as composers. This was the case with Mozart and going further back into the 16th century it is even more so. But how did they improvise and what did they play? This disc gives the listener some insight. It is planned around three madrigals or songs. Arcadelt was one of the most popular and successful composers of the first half of the 16th Century. We here have four variants - the Spaniards of course called them ‘Diferencias’ - on his ’O felici occhi miei’ by Ortiz. We also hear the madrigal by Sandrin, a prolific but little performed Flemish composer of the same period. ‘Doulce memoire’ ends the CD. There’s also a song by Ganassi ‘Io varei Dio d’amore’ which, the notes tell us, is probably the only one to be accompanied solely by the gamba. There are, in addition various Recercatas (in various spellings) on harmonic patterns –nine by Ortiz ‘sopra tenores italiano’ and six on ‘sopra canti piano’ which Ortiz tells us was also known as ‘La Spagna’. All of this original material was well known at the time. 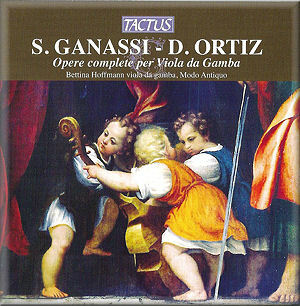 Silvestro di Ganassi dal Fontego, as the CD proclaims him, taught recorder and gamba. He published two treatises from which these pieces recorded are taken: ‘Lettione seconda’ of 1543 and ‘da Regola Rubertina’ of 1542. Diego Ortiz published a treatise of his own entitled 'Trattado di glossas' after he had left Spain for Italy (about 1553) in which he gives examples of diminutio or divisions. These sources are our aid to understanding the instrumental music of the period. The booklet essay by Bettina Hoffmann, who bears the main thrust of the performances on the viol da gamba, talks of them being “unique and invaluable”. The instruments employed are gambas of various sizes, which are accompanied by a harpsichord or organ or sometimes a lute or chitterone. Each track is subtly varied so that the ear does not tire of one particular sound quality. The accompanying instrument is mostly reduced to the function of harmonic support. The solo instrument weaves a complex division, or ornamentation of the upper melody line just like a modern jazz artist. Ortiz became the mastermind behind the whole concept of elaboration on madrigals in the form he called a ‘Ricercar’. The term is often said to mean ‘to search out’ and Ortiz and Ganassi do indeed delve into the melodic and harmonic implications behind the well known songs or tenor lines. The performances are quite magical and stylistically ideal. The instruments are described as “d’epoca”. The essay is interesting but there is no text in any language for the vocal items. The recording is excellent with space and clarity.